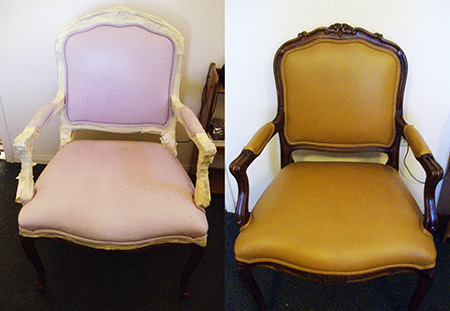 Total Leather Care is your expert leather furniture repair service in San Diego, CA. We specialize in repairs for any noticeable wear and tear your leather furniture has experienced throughout the years. Let us repair your leather furniture to a like-new condition, so you can get the most out of its appeal, comfort, and style for many more years to come. Using artistic skills refined through 30 years of on-the-job experience, TLC craftsman can make cuts and stains disappear from your leather chairs, sofas, and other leather furniture. After using repair compounds designed to stay tough yet flexible, we custom match and airbrush color coats to blend the repair seamlessly and then apply a clear protective coat to produce the proper sheen so your leather pieces look new again. Private owners, interior designers, furniture stores, as well as moving companies rely on TLC to repair their leather furniture. Most jobs can be done at your location, minimizing downtime. When it comes to furniture, leather is a durable material. However, scratches and small cuts can develop from excessive use. Sunlight and hot conditions can dry out your leather furniture, making it more prone to cracks. Claws on cats and nails on dogs can dig into your leather furniture, leaving scratches and tears. Horseplay on leather furniture causes wear and tear that damages the look and finish of your leather. Zippers, buttons, rhinestones and sequins can rub up against your leather, causing scuffs, scratches and tears. While unappealing stains, scratches, scuffs, and tears may diminish the beauty of your leather furniture, the good news is that you don’t have to replace it. Our leather furniture experts can quickly identify your furniture’s leather type and choose the top of the line products to repair noticeable scratches and tears. To avoid future scratches and tears, we’ll apply a finish to your pieces. Once we’ve repaired your leather furniture, you won’t be able to tell where the damage was! We guarantee you’ll be thankful you chose to repair and not replace your favorite leather sofa, recliner, or other pieces! Have leather furniture that’s looking a little lackluster and suffering from damage? Let us repair it! Contact Total Leather Care today at 619-561-6221 and send us a picture of the piece of furniture you’d like us to restore.